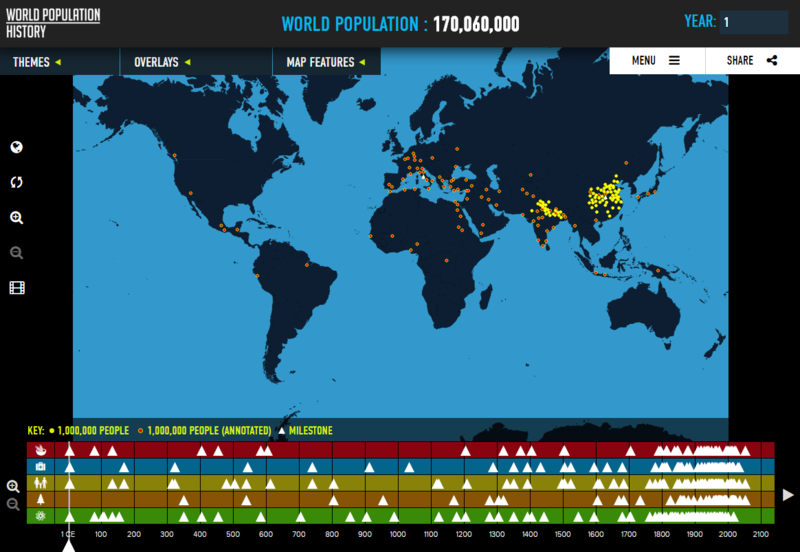 Scooper - Technology News: Where are the world’s population hot-spots? From a population of a little over 170m in 1 C.E., the world’s population is forecast to exceed 9.5 billion by 2050. An interactive map created by Population Connection charts this growth, highlighting recent rapid population increases, as well as concentrations of people around the world. Charting over 2,000 years of history, the map offers an insight into our life on earth. 2,000 years of human history has seen a significant expansion in the global population, with the world population in 2015 put at 7.3 billion people. The following two maps show this change from 1 C.E. (the same point as 1 A.D.) to the present day. 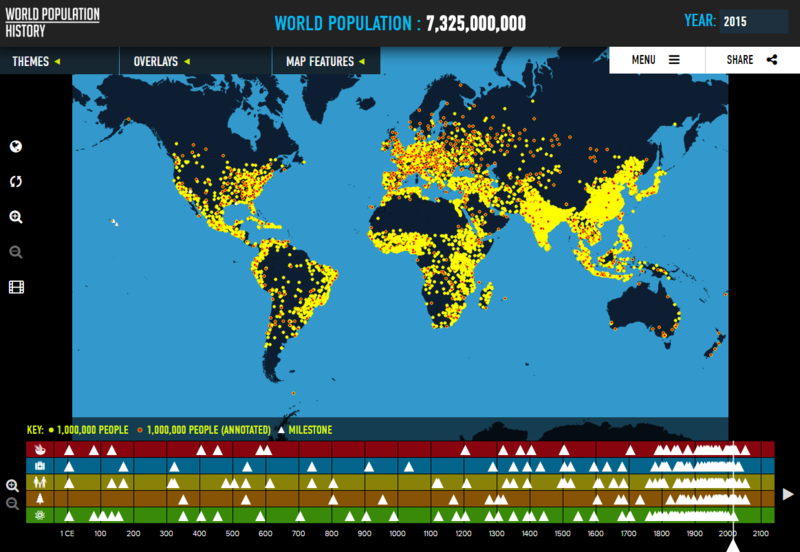 The dots represent population hotspots of over a million people. Where this population is spread out, the dot is placed in the middle of the approximate range. So, as this first map shows, in 1 C.E. the global population was concentrated in Europe, and particularly the Far East. The 2015 map highlights the spread in the population around the globe, from Africa to South America. The timeline also shows the rapid population expansion since the Industrial Revolution, with the population remaining below 1 billion until 1800. Where is the population concentrated? Europe and the Far East remain major hotspots today, as they were in 1 C.E.. Hotspots have also emerged in India, Japan and coastal areas of the Americas. There are also large population concentrations across much of central Africa and part of the Middle East. You can even see a hotspot down the Nile in Egypt. At the other end of the scale, large areas continue to have much lower concentrations. The Sahara, the outback of Australia and much of Canada and Russia have very few dots. Population expansion puts a strain on resources and the environment, presenting challenges for the world as a whole. This strain is most keenly felt in population hotspots, and also in areas which have seen the most rapid expansion. This interactive map offers an important insight into global population trends and patterns, which can help policy-makers tackle these challenges.